With Game One of their second round playoff series in the books already, the New York Islanders and Tampa Bay Lightning are ready to rumble. As most of you know, the Islanders are out to a 1-0 series lead with a 5-3 victory on Wednesday. Thanks to a personal day yesterday and a health issue today, Breaking It Down will take a look at this matchup a day later than expected. But, as they say, on with the show. The Islanders find themselves in the second round for the first time since advancing to the good old-fashioned Wales Conference Final way back in 1993. Tampa, meanwhile, is in the second round for the second straight season and the third time in the past six. Last season, they were two wins shy of winning the whole shebang. Tampa and New York met one other time in the playoffs and that was back in 2004 when the Lightning knocked out the Islanders in five games. That was also the time when the Lightning went all the way and picked up the first and only Stanley Cup Championship in franchise history. But if Game One of this series is any indication, things might take a different course this time around. Thomas Greiss answered some serious questions against the Florida Panthers when he went 4-2 in the first round and posted a 1.94 goals against average with a .944 save percentage. He piled up some incredible performances against Florida, including a 47-save night in Game Five when he road the wave through double overtime. Ben Bishop overcame some defensive difficulties to put up stellar numbers of his own against the Detroit Red Wings. He went 4-1, put up a 1.61 goals against average and a .950 save percentage. He had a shutout in the series-deciding game and didn’t allow a goal in the first period of any of the first round games. Naturally, that statistic changed at 5:44 of the first period on Wednesday night as Travis Hamonic found twine. Tampa’s core came together well, which is somewhat remarkable when you consider the absence of Anton Stralman. He’s been out since March 25 and the Lightning have made the appropriate adjustments, with Victor Hedman leading the charge. He averaged 27 minutes a game and was paired with Matt Carle. Jason Garrison has also been a factor, with two points in his last three games. For the Islanders, Nick Leddy is the man. He had three points against the Panthers and logged serious minutes, with a combined 80 minutes of ice time over the last two games. He was back with nearly 25 minutes against the Lightning on Wednesday. He’s paired with Travis Hamonic, who scored his first career playoff goal against Tampa and logged just over 23 minutes in Game One. 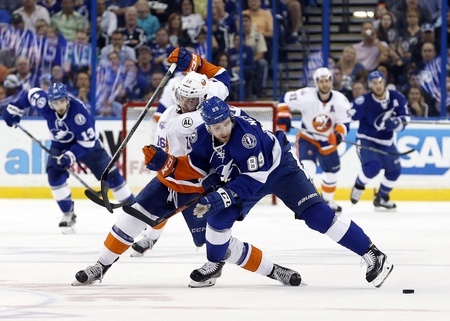 John Tavares was a man possessed in the first round, with nine points in six games. He had five goals and added his sixth for this year’s post-season against Tampa in Game One. He’s produced well with Kyle Okposo, too. The 28-year-old from St. Paul had six points in six games, while Alan Quine also saw some action on the top line. Frans Nielsen had three goals in the first round. As was discussed, Tampa dominated the first round with their top line of Tyler Johnson, Alex Killorn and Nikita Kucherov. They were responsible for 10 of their team’s dozen first round goals, with Kucherov piling up five goals and Johnson collecting seven points. The Lightning will still need to find secondary scoring, which could mean an even bigger role for Jonathan Drouin. With the additional evidence provided by New York’s Game One victory, this should be a pretty interesting series – to say the least. Tampa will have to shuffle the deck once more without Steven Stamkos and Stralman in the lineup. Jon Cooper is up to the task and he’s shown confidence in Drouin, which could pay some dividends down the line. The Islanders have shown a knack for putting the puck in the net and they’ve also shown a pretty impressive power play, going five for 21 on the man-advantage in the first round. And the penalty kill was good, too. They killed 13 of 15 and look game to shut things down against the Lightning. They held Tampa off the scoreboard on two power plays so far. Based on the available evidence, I’m comfortable predicting a Tampa Bay victory in six games.